Air Assault game download. 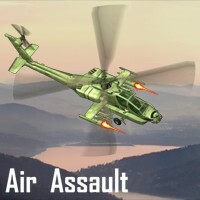 Free download Air Assault for Mac. On a mission against terrorist forces, fly your helicopter through enemy lines in this classic arcade-style scrolling shooter! Destroy as many of them as you can using your powerful and upgradeable machine guns or deadly missiles. Grab powerups while you're flying - they are very useful and will help you in different ways. Your Air Assault Helicopter is the world's last and only hope!